Total project done within 7 days from start to finish. Better pics will come after it returns from the show! Good job MJ! Quite impressive for a 7 day-er! 1. It all seems a bit glossy. I don't know if that's just the photography though? I personally love the picture frame.. much better than using it for a stuffy painting of some flowers or similar..
very realistic rust youve got there, is the recipe posted up anywhere? 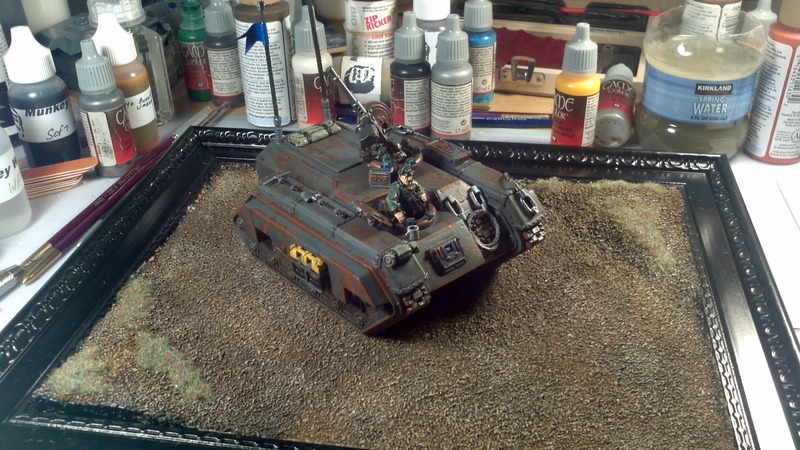 Man I miss painting tanks.. its been years!! And here im torn..... I LOVE picture frame displays for models, as they are quick and easy. This one in particular is not great because the frame "valleys" instead of "Hills". Its fairly effective if you have the right picture frame. This one was one i had at hand and was used because it was there without a search. Anvils Hammer wrote: I personally love the picture frame.. much better than using it for a stuffy painting of some flowers or similar..
And recipe.... nothing make already BUT its super easy and fast.... rustoleum rust red primer as a primer, and airbrush or stipple Dreamcoat terracotta and burnt orange random. Any red/brown and orange will do fine im sure. When done it will look a mess but your going for visual depth. Then I gloss coat it to protect and sometimes mattecoat it for better paint adhesion. Then I sponge on liquid Mask medium randomly and where I want it to rusty. then paint as normal with airbrush. After paints dry I take a toothbrush and remove all the mask and BLAMMO rust fit for a Ork!!! I do go back sometimes and accentuate the rust with VERY THINNED (like glaze thin) terracotta and burnt orange but its not 100% required and only do it on real rusty things. 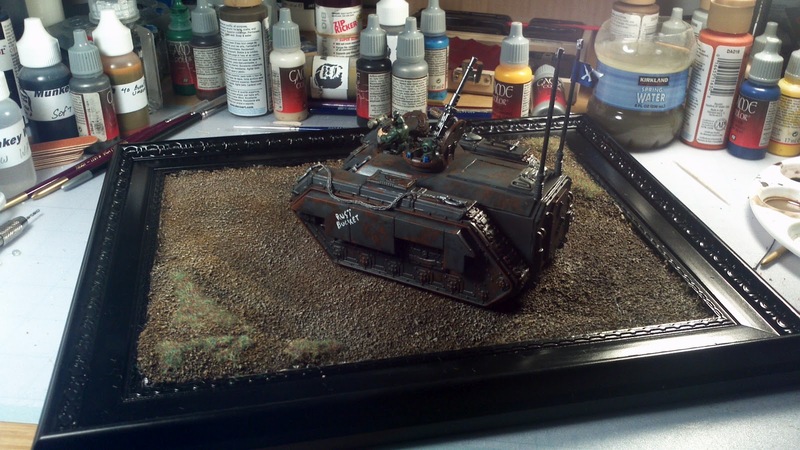 If your interested i can do one of my looted ork tanks and take pics to help explain anything I did not make clear. or feel free to ask!! Actually, I could see the frame making sense if you wanted to force the viewer into an overhead view of the diorama, but for vehicles and troops we generally want the viewer to be able to see "eye to eye", hence why plinth mounting is the traditional style. Interesting to read your rust technique - it does indeed look really good! I've got an Ork Mega Dread half assembled that I will paint up once my SAW diorama is done, and I think I'll give the hairspray and salt technique a go for that! I see your point about the Frame..... It does distract both by the gloss and and shape/design of the frame.... but it detracts from a sub par paintjob!!! LMAO!!! And your assessment of the view is spot on..... I have never thought of that..... but it does force you into a "fake" view compared to what it should. And About the rust... I use the salt -Hairspray also, but this is a effective fast and easy, IMHO and its great for someone who has MANY MANY items (Tanks) to do it on and easy to replicate for a cohesive force. Basically its a cheat to give similar results, and Salt-HS is the right way.....but its something I can get rough with and abuse while rushing and not worry about removing the effect before its time. As Always I welcome feedback, good and bad, and me "defending" what i did is not to debunk anyone's opinion, but more of a reason why I did what i did. 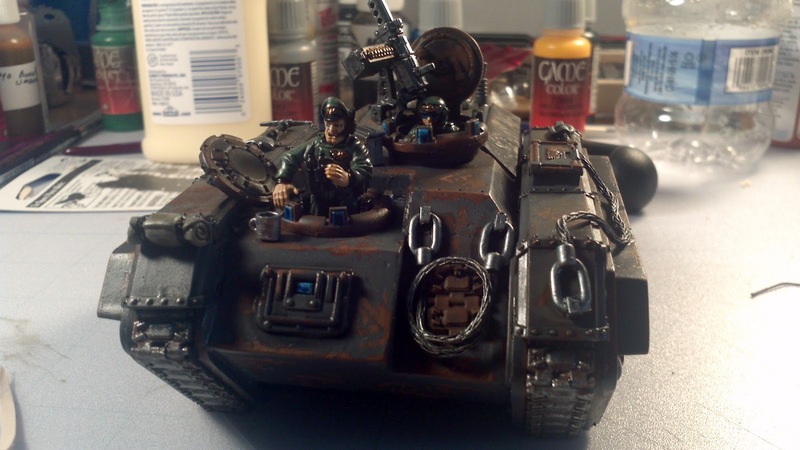 And some of the Better painters, I welcome your opinions too, as well as tips for "cheap,down and dirty" but great effect..... Vaaish, Pig, Ark.... feel free to bash! !